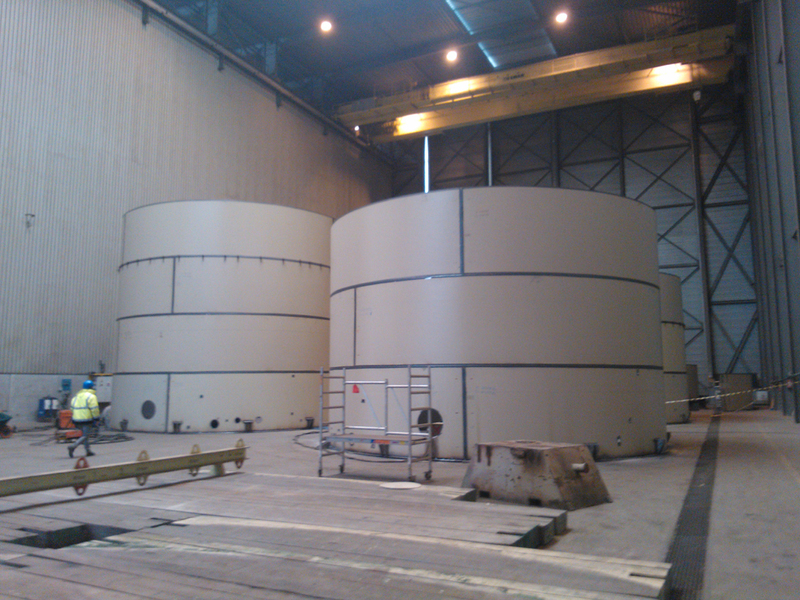 The Antwerp company ADPO, a provider of logistics services as well as storage and handling, has awarded a contract to Engicon nv (Geldof), based in Harelbeke, for the design, construction and placement of 57 storage tanks, 34 of which are to be made in ordinary steel and 23 in stainless steel. The tanks will be used for three tank farms in the new ADPO LLH (Liefkenshoek Logistic Hub) Terminal, which ADPO is building in Antwerp on the left bank of the Scheldt. Geldof made a convincing offer with a tailor-made approach and good pricing. The project is expected to be completed this autumn. For this project, ADPO was looking for a supplier that could deliver and install on-site completely finished tanks with a height of up to 12 metres. The 57 tanks weigh between 9 and 47 tons and have a capacity of between 150 m³ and 1,500 m³. “Our shop-built approach is a perfect match for these expectations. It means we keep our activities at the new greenfield site to a minimum so that the customer can focus on other activities such as civil works, piping and utilities,” says Kevin Mortier, Project Manager at Geldof. “The tanks will be equipped with stairs, platforms, fire extinguishing water pipes, etc. to make rapid assembly possible. This saves a lot of time compared to construction on-site and the customer can start using the tank farm almost immediately,” says Mortier. ADPO’s trust in the knowledge and expertise of Geldof grew during the preparatory phase. ADPO was convinced that their proposed approach was the best one for this project. The shipment will happen in three phases, the first of which is planned for the end of July. The three tank farms will provide a storage capacity of 37,500 m³.